Florence K Upton (1873-1922) was born in New York in 1873, the daughter of English émigrés to America. 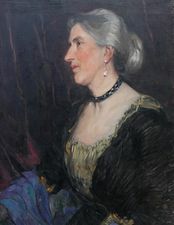 Following the death of her father in 1889, she returned with her mother to England and began painting and illustrating in order to assist her family financially. Together with her mother Bertha, she devised the Golliwog books, Bertha writing the stories while her daughter made the illustrations. Although she made her living largely through illustration, she was nonetheless a very accomplished painter in her own right, described by her biographer, Edith Lyttleton as 'a considerable artist...accessible beyond the normal to sense impressions of colour and form'. Upton studied under George Hitchcock in Egmond Hoef, Holland and became great friends with both George and Mrs Hitchcock (Hind). She exhibited at the Paris Salon and the Royal Academy, including several paintings depicting Holland, with which she had a particular affinity. In 1905 she exhibited “Le salon Jaune” at the International Exhibition in Nantes and gained the Medaille d’honneur. After the exhibition Florence was made “Societaire” of the “Societe Nationale des beaux Arts” After her death the picture was purchased by “Friends of Art” society in Baltimore and now hangs in their gallery. She was also an excellent portraitist and her subjects included her friend, the celebrated actress Mrs Patrick Campbell; indeed Upton's portrait was considered to be one of the finest of her and the actress cherished it until her death in 1940. In March 1917 Christie's opened a 12 day sale - an interesting feature of the third day was the original Golliwog and his Dutch Doll companions, with the original drawings and MSS of the eleven famous Golliwog books, presented by Upton herself, which fetched £472.10.0. The set of dolls was since been presented to the London Museum. The amount Florence raised was used to purchase a “Golliwog ambulance” - which was sent to the front in France. She died on 16th October 1922 and is buried in Hampstead Cemetery. Her obituary in The Times rightly recognised that she was ‘first a painter and second a children's book illustrator’.